NOTE: Please enter "Exploring" in the Notes field so that your gift is directed towards this program. Help provide positive and meaningful career experiences and leadership opportunities for young people in San Diego and Imperial Counties by making a donation and becoming a Friend of Exploring. Every dollar contributed to the Friends of Exploring campaign stays in San Diego and Imperial Counties to support and further develop Exploring programs. Eighty-four percent (84%) of funds are directed to program services, with the remaining funds directed to development and fundraising (9%) and the general fund (7%). As a Friend of Exploring your gift will leave a lasting impact on the lives of these young people, their families, and our community. Thank you in advance for your consideration and support. 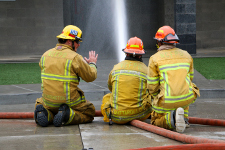 "Fire Exploring gave me valuable insight into the fire service profession by offering hands-on career activities." "It has been fun to watch Explorers learn about law enforcement and see several go on to become police officers."